Among the many uses to which the phonograph will be applied are the following: ... 2. Phonographic books, which will speak to blind people without effort on their part. ... 9. Educational purposes; such as preserving the explanations made by a teacher, so that the pupil can refer to them at any moment, and spelling and other lessons placed upon the phonograph for convenience in committing to memory. Here we are 130 years later and we are still talking about this like it is a bold new concept. 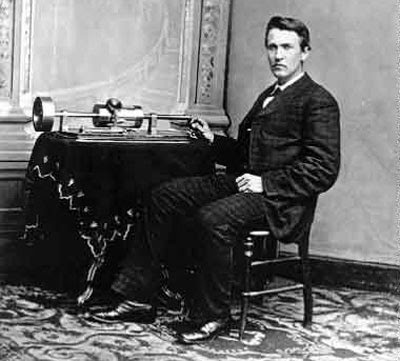 In the short term, it turned out that the killer app for the phonograph was music. Edison didn't anticipate the strong demand in that direction. With the wide adoption of phonographs and the existing infrastructure of the postal system, there is really no good technical reason for the delay in the evolution of mainstream education towards multi-media dominance. It seems that, most often, progress happens by combining existing technologies in new ways instead of waiting for radically new inventions. But these combinations must wait for the right conditions to facilitate the process. Podcasting is a really good example of that. The technology itself, the delivery of files via RSS subscription, is really very simple by the standards of the late 90s, when it was developed. But I think it took the marketing genius of Apple with their iPod campaign to make all things pod desirable, even (or perhaps especially) to people who didn't really know what it was. Ironically, the reality is that, at least in my current classes, most students use their laptops and not their ipods to access podcasts. But it doesn't matter - the social impact has been to make podcasting generally desirable and the pressure is being felt now in educational institutions to provide it. I also think that the recent availability of high quality free and hosted services, exemplified on a mass scale by Google, is also key to the current transformation. Going forward we have to remember that we can't predict the timing of technological change, even if it is inevitable.